Equity Markets had a thoroughly disappointing session on Wednesday as the NIFTY slipped after witnessing selling pressure and ended the day with a net loss of 97.75 points or 0.91%. The grim part of the story was that the NIFTY showed likely breakdown from a pattern formation which shows the NIFTY right into its apex and subsequently giving up. Thursday’s opening levels and trajectory post opening would be extremely crucial for the Markets. 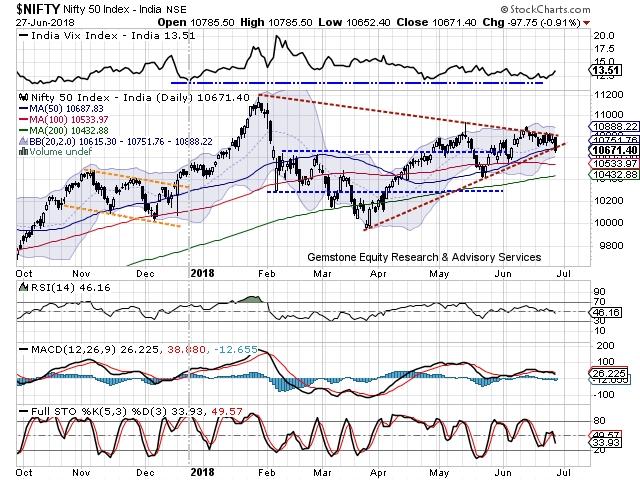 If the NIFTY does not show any pullback on Thursday, it has increased its chances of progressing ahead with a breakdown and confirming it. In the process, in event of any meaningful pullback, it will also increase its chances of testing its 100-DMA which stand at 10533. The coming days remain highly crucial from such many angles. Thursday is also expiry of the current derivative series and given the shorts in the system, we also stare at a possible pullback. However, the broader pattern formation forces us to sit with fingers crossed. On the higher side, the levels of 10720 and 10760 will resist the pullback, if any, while the supports will come in much lower at 10640 and 10590 zones. The Daily RSI stand at 46.1609 and it has marked its 14-period low which is bearish. MACD stays bearish while it trades below its signal line. On the Candles, a big white body occurred. 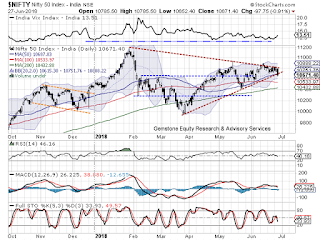 It remains significant as it emerged near the pattern area resistance of the falling trend line and lends further credibility to the resistance. Overall, we stare at a two way move on the NIFTY. On one hand, there are remote chances of a technical pullback happening if the NIFTY validates the 50-DMA support at Close. NIFTY has closed a notch below this. Also, the high amounts of shorts that exist in the system provide a ray of hope for a technical pullback given the expiry day. On the other hand, NIFTY stares at a possible breakdown from the large symmetrical triangle formation which would make it vulnerable to test 100-DMA. We recommend highly cautious approach to the Markets and advice staying away from creating any major exposures. Fresh shorts were seen in the stocks like IDEA, SAIL, IDFC, IDFC BANK, ICICI BANK, ITC, DHFL, PFC, TV18 BROADCAST, ASHOK LEYLAND and NTPC.